Workplace Giving is a simple and tax-effective way for employees to make regular donations to Garvan’s medical research directly from their pay. 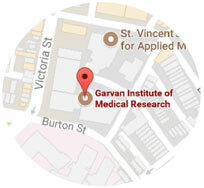 There are no commissions or administration costs, so every dollar raised goes directly to Garvan. Regular donations mean we’re able to budget and plan medical research programs well into the future. And, since employees’ donations are taken from pre-tax income, it’s a convenient and cost-effective way for them to give. You can also choose to match their donations – a great way to show your commitment to giving back and supporting the causes your employees are passionate about. Flexibility and choice – you choose how much you’d like to donate each pay cycle, and the area of breakthrough research you’d like to support. Updates – regular updates on how your donations are changing the future of medicine. The best part of Workplace Giving is that the donation is made from your pre-tax income, so the tax deduction is immediate. For example, if you nominated a donation of, say, $5 each pay cycle it would actually cost you less than that (depending on your level of taxation), because of the automatic tax deduction. Your chosen charity however receives the full $5. If your employer chooses to dollar-match employee donations then your generosity goes even further. A useful explanation of what’s involved in Workplace Giving to hand out to your employees. Aleksandra Ilic donates regularly to Garvan as part of the King & Wood Mallesons Workplace Giving Program. It’s important to her to give back to the community and she enjoys being able to make a real difference collectively with others. For Aleksandra, the life-saving advancements of medical research make it the most important scientific frontier of our time. With Workplace Giving, she is able to contribute to this cause in a simple and straightforward way. Interested in workplace giving for your company? If you would like to discuss the possibilities that would work best for your company, please contact us.